HILTON HEAD ISLAND, S.C. – The Hilton Head Island Motoring Festival & Concours d’Elegance, one of the nation’s largest and fastest-growing automotive and motorsports enthusiast event weeks, takes a more glamorous approach with its annual “Life” exhibit and presents Life of the Rich & Famous sponsored by Marriott Vacation Club. Life of the Rich & Famous is the sixth annual “Life”-themed exhibit on the Festival’s Motoring Midway. Past themes include Life on the Beach, Life on the Farm and, the one that kick-started it all, Life on the Road. This year’s exhibit, Nov. 1 – 2 at the Port Royal Golf Club, will be highlighted by three 1956 Continental Mark IIs that pay homage to this year’s Honorary Chairman, Edsel B. Ford II, and the entire Ford family. 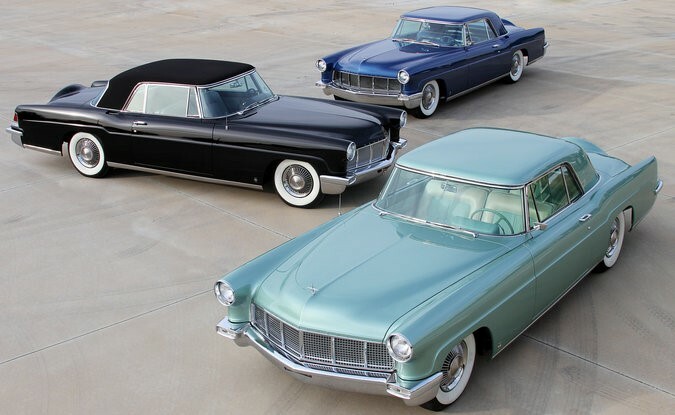 Each Continental was specially ordered by a Ford family member, including one that was built to the specifications of Henry Ford II for his wife, Edsel Ford’s mother, Anne. All three cars are currently owned by Jim Schmidt and his son, Rick, from Ocala, Florida. Following its debut at the 1955 Paris Motor Show, the Mark II quickly became the car of choice for many of America’s famous names, including Elvis Presley and Frank Sinatra. Warner Bros. studio gave a 1956 Continental Mark II to Elizabeth Taylor, custom-painted to match her distinctive eye color. For more information on the Hilton Head Island Motoring Festival & Concours d’Elegance, visit the official website at www.HHIMotoringFestival.com. Tickets for the 2014 Motoring Festival are available for sale online at http://www.hhimotoringfestival.com/tickets.